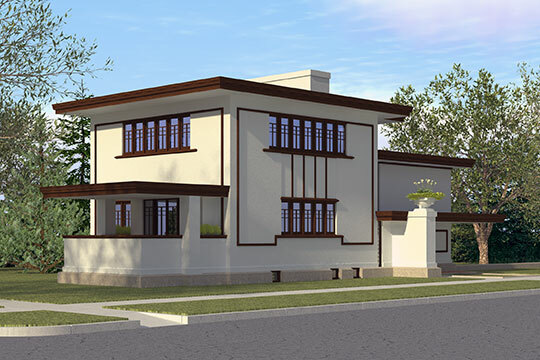 Photo: Digital reconstruction (Google Sketchup) of the Wynant House (1916) by Frank Lloyd Wright in Gary, Indiana. This house is the only known construction of plan D101 from Wright's American System Built Homes. The house was largely destroyed in a 2006 but the ruins still stand. Graphic by User:Fox69 (own work), 2010, via Wikimedia Commons, accessed May, 2013. The Lake County Courthouse is located at 2293 North Main Street, Crown Point, IN 46307; phone: 219-755-3461. Lake County was first settled near Crown Pointe in 1834. The first families were the Fancher, Wilson, Hornor, Robinson, Childers, Clark and others. The first Court of Justice in Lake County was organized in 1836. The Town of Liverpool became its first county seat but existed only on paper. The same year the first post office was established in the village of Lake Court House, in the store of Solon Robinson. The county was organized in March, 1837. The first regular physician in the county was Dr. H. D. Palmer. Religious services were first held at Solon Robinson's home. The first church buildings erected were the M. E Church and St. John Roman Catholic, both in 1843. The county seat was located at Crown Point in 1839. At that time the entire population of the county was 1,463. By 1847 Lake County had 7 post offices, 5 saw mills, 2 grist mills, 5 church buildings, 5 stores, about 50 frame houses, many more log houses, 2 lawyers, 7 physicians, 15 justices of the peace, 5 local ministers, one circuit preacher and 1 Presbyterian preacher. The first railroad to enter Lake County was the Michigan Central in 1851. Clyde R. King and E. E. Woodcock, Souvenir Album of Lake County Indiana, 1906.